Tahiti is the largest island in the Windward group of French Polynesia, located in the archipelago of the Society Islands in the southern Pacific Ocean. It is the economic, cultural and political centre of French Polynesia. The island was formed from volcanic activity and is high and mountainous with surrounding coral reefs. The population is 178,133 (2007 census), making it the most populous island of French Polynesia and accounting for 68.6% of the group’s total population. Tahiti was formerly known as Otaheite. The island of Tahiti's area of 1,043 square kilometers makes it the biggest island in French Polynesia. Its shape stems from the juxtaposition of two extinct volcanoes of different sizes that are linked by the Taravao isthmus. The result is Tahiti-Nui, or Big Tahiti, the main island, and Tahiti-Iti, or Little Tahiti, the peninsula. The highest mountains on the island of Tahiti are Mount Orohena, with an altitude of 2,241 meters; Pito Hiti (altitude 2,110 meters) and Mount Aoraï (altitude 2,066 meters). Tahiti is a mountainous island, most of which, like all of the territory's other high islands, is difficult to exploit. As a result, only 150 square kilometers of the island's area is inhabited and exploited. That is why most of the population is found along the island's coastal strip. Tahiti has been, and remains, the required stop for all migrations. For example, it was a priority stop for the first European navigators visiting this part of the world. Tahiti today has the territory's only international airport and is the center of the territory's economic activity. Its name has become synonymous with a myth. What began as O Taiti became Tahiti, made famous throughout the world by the paradise tales of the first English explorers. Tahiti's long-lasting myth was reinforced by the 1789 HMS Bounty adventure and the territory's attraction for French painter Paul Gauguin, who arrived in 1891 and died in the Marquesas Islands in 1903. And the history of the European discovery of Tahiti was an adventure that only furthered the dreams. The capital, Papeete, is located on the northwest coast with the only international airport in the region, Faa’a International Airport, situated 5 km (3.1 mi) from the town centre. Tahiti was originally settled byPolynesians between CE 300 and 800. They comprise about 70% of the island’s population with the rest made up of Europeans, Chinese and those of mixed heritage. The island was proclaimed a colony of France in 1880 although it was not until 1946 that the indigenous Tahitians were legally authorised to be French citizens. French is the only official language although the Tahitian language (Reo Tahiti) is widely spoken. It was part of the Kingdom of Tahiti until its annexation by France in 1880. 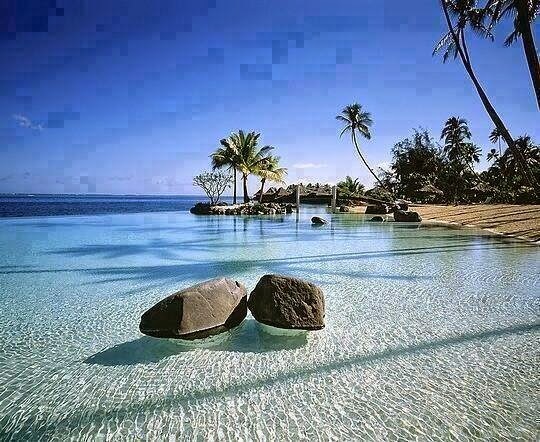 Tahiti is the highest and largest island in French Polynesia. It is located 4,400 km (2,734 mi) south of Hawaii, 7,900 km (4,909 mi) from Chile and 5,700 km (3,542 mi) from Australia. The island is 45 km (28 mi) across at its widest point and covers an area of 1,045 km2 (403 sq mi). The highest peak is Mont Orohena (Mou’a ‘Orohena) (2,241 m (7,352 ft)). Mount Ronui (Mou’a Rōnui) in the southeast rises to 1,332 m (4,370 ft). The island consists of two roughly round portions centred on volcanic mountains and connected by a short isthmus named after the small town of Taravao, situated there.